Mill-Max has added a through-hole version of our 2mm pitch spring-loaded connectors to complement the series' surface mount version. As always, real estate is at a premium in electronic packaging with designers demanding tighter pitch interconnects that deliver high quality performance. These spring-loaded connectors (SLC's) are an appealing option combining both durability and space saving qualities. For board-to-board or device-to-board connections with the additional security of through-hole mounting, these 2mm spring-loaded connectors are a practical solution. The connectors feature spring pins with a working travel of .0275" (0,7mm) and a maximum travel of .055" (1,4mm). The initial, uncompressed, height of the connectors from the board surface is .295" (7,5mm). Mill-Max also offers standard 2 mm pitch mating target connectors in through-hole and surface mount varieties, each with the option of a flat or concave face. When mated with through-hole target connectors, at mid-stroke, a board to board height of .425" (10,8 mm) is achieved; .408" (10,35 mm) with the SMT targets. The connectors feature a solder tail diameter of .022" (,56mm) and a plunger diameter of .032" (,81mm) allowing adequate space for laying out the PCB holes, pads and traces on both the solder and mating sides of the connectors. These new through-hole SLC's are offered in single row, series 836-22-0XX-10-001101 and double row, series 838-22-0XX-10-001101. Standard availability is 2 to 50 positions for single row and 4 to 100 positions for the double row. Both series are designed for manual placement into ⌀ .030±.003" plated through-holes in the circuit board prior to hand, wave or reflow soldering. The new 2mm pitch spring-loaded connectors maintain the quality and reliability of current Mill-Max spring pin connectors by utilizing the same precision-machined components and internal spring components. Gold-plated components and springs ensure the highest conductivity, corrosion resistance and durability. 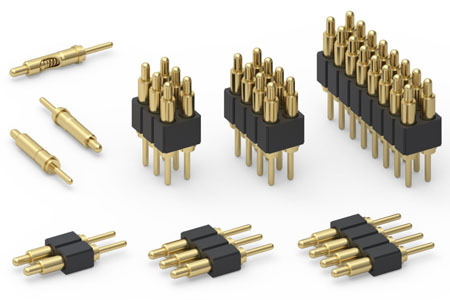 The spring-loaded pins used in these connectors have a current rating of 2 amps continuous use (3 amps maximum.) The high temperature plastic housing is suitable for all soldering processes and the connectors are RoHS compliant.